The findings couldn’t be clearer: The more words your baby is exposed to before age three, the better she will do in school. Children from vocabulary-rich households are definitely more successful both academically and socially than children from households where there is little talk. Your baby is also tuned into language prenatally, and although she can’t attach meaning to the words, she can hear a variety of speech sounds, rhythms, and intonations from inside the womb. By talking to your unborn baby you will be helping her build a strong foundation for learning to speak, listen, and eventually read. Consider the innovative research done by Drs. Betty Hart and Todd Risley at the University of Kansas in 1995. They followed 42 families and observed the language interactions between parents and their children, beginning when they were infants and continuing until they entered grade school. What they discovered was that in families where there was a great deal of talk, children performed well in school and, conversely, that in families where there was little talk, children were often struggling. Other studies have since provided evidence that children who are exposed to rich vocabulary and language not only become better readers, but also excel socially. Those children who were not frequently exposed to spoken language presented a huge disadvantage in following directions, learning routines, and making friends. As a matter of fact, more than half of children with limited vocabularies at age three will have trouble learning to read later on. There is no better place or time to start talking to your baby than when she is in your womb. 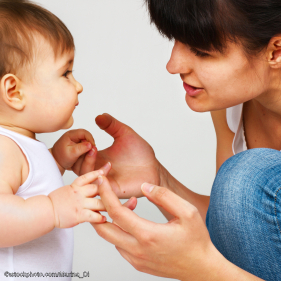 The words you say now will contribute to your child’s language development. Once she’s born, you can help your baby to make a visual connection to the words she has heard, but for now, the best thing you can do is just talk, talk, talk. Dr. Risley says that it doesn’t matter what you say; all talk is good talk. However, the research does say that reading something rhyming and rhythmic will help your baby to remember the words she hears, giving her a head start for building her own oral language. When your child is born, you will support her acquisition of new words by pointing out illustrations in books, and adding facial expressions and gestures. Your baby is already on the way to becoming a reader! And even better, you have created a close relationship with your child by sharing and enjoying language together. The words you’ve introduced your baby to in utero are the seeds that will eventually grow into the give-and-take of real conversation. By exposing your child to words from the very beginning, not only will you promote her success as a reader and a student, but you’ll give her the tools to communicate and so develop close and meaningful relationships . . . in the family, in school, and beyond. Check out this great Reading Rockets webcast, From Babbling to Books, for more info on Hart & Risley.